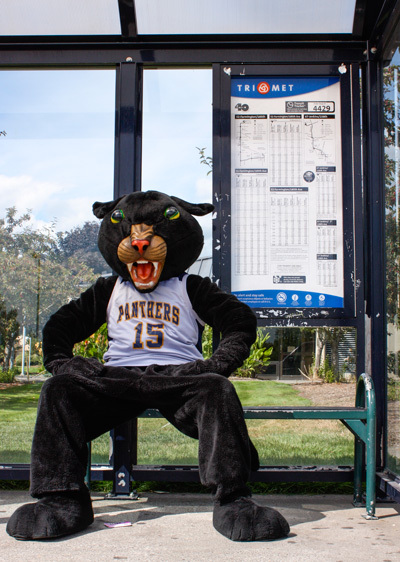 To promote and encourage riding public transit, PCC offers cost saving programs for both students and staff. TriMet tickets and passes are also available for purchase at all campus bookstores. If you’re enrolled in a program such as Oregon Health Plan, SNAP or TANF, or if you meet income requirements, you may be able to ride TriMet for up to 72% off the Adult fare. Apply for the reduced fare at the TriMet website. Any student taking three or more credits may purchase a Student Select Pass. This is an all-zone pass good for travel on TriMet from date of purchase through June 30, 2019. We will sell these passes (valued at $300) for $150 beginning March 20, 2019. Passes may be purchased at the Student Account Services office located at one of the four main campuses (Sylvania, Rock Creek, Cascade, or Southeast). Your student photo ID card is required when purchasing. TriMet pass sales will end April 17, 2019. Note: Neither PCC nor TriMet will be responsible for any lost or stolen passes. Passes will not be replaced. All PCC faculty and staff (including casual employees) can purchase a monthly TriMet pass on a pre-tax basis. For the average employee, this would reduce the cost by approximately 22%. Individual savings will depend on your income tax bracket. To sign up or cancel the program, complete a pre-tax payroll deduction application and submit the completed form to the Payroll Department. Applications and cancellations may be made at any time, but must be received by Payroll prior to the 15th of each month to become effective by the following month. Note: Neither PCC nor TriMet will be responsible for any lost or stolen passes and passes will not be replaced. TriMet offers a trip planner to help you find your way. For trip planning contact Michael Kuehn or use the TriMet trip planner. Newberg: Yamhill County Transit offers shuttle service from McMinnville to Newberg to Tigard on routes 44 & 45X. Yamhill County Transit Route 7 services the PCC Newberg Center . Tigard Transit Center: Connects WES commuter rail to line 78. Students: you can use your TriMet Student Select Pass on C-Tran to PIR/EXPO! Ride C-Tran or drive to the PIR/EXPO Yellow Line light rail station and then take the Yellow Line to Killingsworth. At Killingsworth, catch bus 72 to campus.